When monies meant for educating our children and youth population are stolen by just few people, that is a threat to our national development. When monies meant for providing basic social services for every citizen are stolen by just few people to build mansions and buy luxury cars, that is a threat to our national development. The Truth and Reconciliation Commission (TRC) report has continued to remind us loudly that corruption was one of the main causes of the bloody civil war in this country. Despite strong anti-corruption laws introduced in 2000 and amended in 2008, governance institutions and national development have been perennially weakened by corruption. Corruption has thrived because there has been a lack of strong political will and the near absence of a steely determination to draw a line under corruption once and for all. Successive government audit reports reminded government between 2007 and 2018 of gross inefficiencies and deficiencies in governance and public accountability, leakages, and downright squandering of state revenue and resources. The responses were more lip service to fighting corruption, sham trials, and backdoor acquittals and reinstatements of public officials. Two days after I took up office, I commissioned a Governance Transition Team (GTT) to investigate perceived governance and public accountability issues that had led to the near collapse of the state. 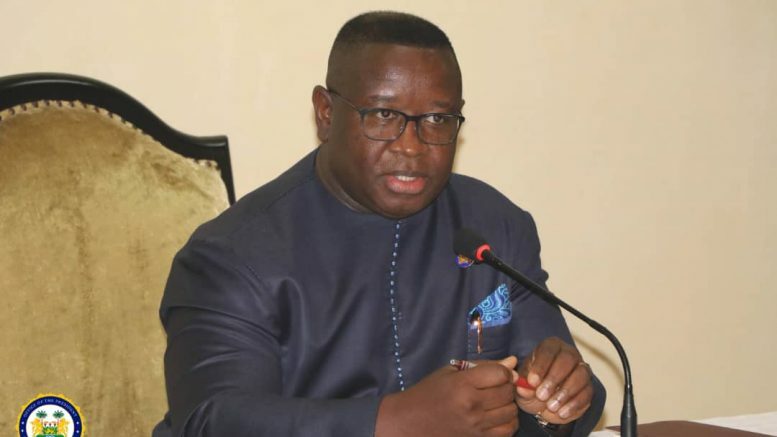 Their report concluded that rampant corruption, fiscal indiscipline, and abuse and misuse of public office had left Sierra Leone in a dysfunctional state. The country was overburdened with debt, a near moribund economy, weakened governance institutions, and gross inefficiencies and injustices in governance processes. Based on the recommendation of the GTT report for judge-led Commissions of Inquiry, my government requested the legislature to debate and institute the Commissions of Inquiry as required by law. The Commissions of Inquiry will look at three key issues: governance processes, assets, and the outcomes of the forensic audits. The forensic audits tracked fraudulent activities within entire chains of governance. The commission on assets will look closely at disparities between income or means and assets. The Commission on governance processes will examine inefficiencies and deficits in governance especially where people deliberately misused public offices or took advantage of state institutions. As I have said repeatedly, this war against corruption is a war we must win. I have fully empowered the Anti-Corruption Commission to use all its legal powers to relentlessly investigate and prosecute all cases of corruption even in my administration. Therefore, let me make this solemn promise to the nation that anyone found wanton of corruption in my administration will be promptly removed from public office and subjected to the full force of the law. As a government, our fight against corruption is and will remain as consistent as it is robust. As a country, we must put an end to this culture of rampant thieving, abuse, waste, and impunity. We must foster a culture of public accountability. The Commissions of Inquiry are a public commitment by us as Sierra Leoneans to rid our country of corruption, fraud, abuse, and waste.